You might say Jim Chamberlin tends miniature livestock as part of his work with Happy Dancing Turtle (HDT), a nonprofit organization in Pine River near the heart of Minnesota’s cabin country. That probably deserves an explanation: as HDT’s food and water security coordinator and grounds manager, Chamberlin oversees a two-acre demonstration garden that’s a showcase for sustainable food production methods. Designed in 2006 by permaculture specialists, the garden uses the alley cropping system whereby two-foot tall berms planted with perennials, from fruit trees to medicinal herbs to pollinator favorites, are interspersed with annual vegetable plots. “We talk a lot about soil and soil health. I like to say, ‘We don’t grow vegetables, we grow soil.’ And that microbes in the soil are tiny livestock and if you have healthy soil you have healthy plants,” says Chamberlin. The region’s soil composition is better suited to pasture and grazing than to row crop production. Without good agricultural practices, water quality suffers. Approximately 17 years ago, the Minnesota Pollution Control Agency declared a critical lake, Lake Margaret, in the Crow Wing River watershed impaired. Lake Margaret feeds into one of Central Minnesota’s last reproducing trout streams and into bigger Gull Lake. Since then, concerned citizen groups have formed to promote best management practices that protect water quality. Chamberlin works with the Crow Wing River Basin Forage Council to open up dialogue between ranchers and lakeshore owners about water quality. The Council hosts workshops and tours of local farming operations as well as pontoon tours of lake properties implementing good practices, and collaborates with the Cass County Farm Bureau to plan an annual harvest dinner for property owners. This year’s keynote speakers were shrimpers from the Gulf Coast who brought sustainably harvested shrimp for the meal. They spoke about the hypoxia (or low oxygen) zone caused in part by agricultural activity, and the impact of Minnesota water quality on their livelihood much farther down the watershed. “What you do here affects us down there,” was their message, said Chamberlin. 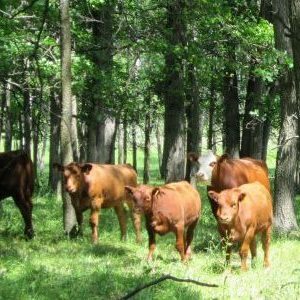 A tour of nearby Grandview Ranch in conjunction with the dinner showcased sustainable practices such as rotational grazing that increases forage production which in turn allows more cows per acre. The Gulf Coast shrimpers were able to attend this tour and see first-hand what proper management can do. The local practice of sustainable agriculture is good for the land and water, and it’s a draw for consumers who want to know where their meat comes from. The market for locally grown meat is evident in the central lakes area according to recent research conducted by a University of Minnesota graduate student and funded by the Regional Sustainable Development Partnership program. A survey indicated that 60 percent of area consumers would prefer to buy local even at a higher cost, but there’s no USDA or state equivalent processing facility in Cass County. All cattle must leave the county to be finished and slaughtered – and all the local retailers get their meat through the conventional food distribution system. To meet the demand for local meat HDT is working on a business plan for a mobile slaughter unit that would allow animal processing at local ranches. “This mobile slaughter unit would harvest Pine River watershed animals on sustainable farming practice ranches,” Chamberlin said. “We have several small custom butcher shops. A rancher can sell an animal to a butcher for personal use, but not for resale.” Instead, the mobile unit would allow a cow to be processed on site into what’s called a primal cuts – there are 8 cuts per half of the animal. Then these primal cuts would be redistributed to restaurants, resorts, and butcher shops or groceries which could break them down to consumer ready cuts. After training with the Initiative Foundation out of Little Falls, HDT has applied for a USDA grant to be able to hire a half-time staffer to finish up the details of the business plan, secure the financial package and make this vision a reality, he says, ideally within a couple of years.